Confession time. I’m a HUGE Tim Ferriss fan. I think Four Hour Work Week should have been called “How to do Life”. I use it like a manual. It’s one of the main reasons I’ve been so motivated to build my business and create the freedom to work from anywhere. Grocery shopping, meal planning and preparation were all super easy on this diet. I knew exactly what I needed when I was at the store, I could prep everything twice a week and cooking was a breeze. The meals are simple. Prepared the right way and with the right condiments (all hail, King Guac! ), they can also be delicious. You don’t need to work out to lose weight on this diet. You don’t need to spend hours at the gym trying to elliptical the fat off. I did continue working out during the diet, but didn’t have to go as often to see results. If you read my post on decision fatigue, you know that making decisions causes mental fatigue, even the little ones like deciding what to wear or eat. The more fatigued we get, the poorer our decision making. With the SCD, I always had food in the fridge that fit one of the three food groups (discussed below if you’re interested), so I could put together a meal in no time. No racking my brain at 4pm trying to figure out what to cook. No standing like a gaping-mouthed zombie in front of the fridge trying to find something to eat. No decisions necessary. This is the best part of the diet. Saturdays are free-for-alls. You are required to cheat on this diet and by cheat, I mean you can eat whatever the hell you want. How great is that? Mat and I noticed that during the week, we would get amped planning out the dirty food joints and bakeries we wanted to hit. Saturdays quickly became a day of complete decompression from our week. No work, no stress, no thinking about our diet, just complete freedom. Freedom Faturdays are our mini-vacation every week, which allows us to hustle hard every other day of the week. Above all else, I felt amazing. I had increased energy, my skin was glowing (and my skin is usually terrible) and my digestion was on point. I was never bloated and sluggish, except for maybe at 11pm on Faturday after a DQ Blizzard, fries from Mickey D’s and a cream filled pastry, but that was my own doing. 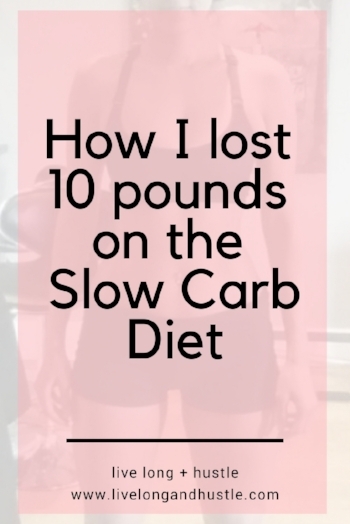 If you’re interested in learning more about the diet, there are details on TF's blog: https://tim.blog/2007/04/06/how-to-lose-20-lbs-of-fat-in-30-days-without-doing-any-exercise/comment-page-10/. I would recommend reading the book, Four Hour Body, if you’re going to do the diet as it goes into way more detail. If you'd like some nitty gritty, like keys to my success, the rules I followed, etc., keep reading. Disclaimer: I may have a few things wrong - this is just what worked for me, so if you’re really interested in the diet, please read the book. There are three main “food groups”. Protein, legumes and vegetables. Have something from each of them at each meal. No dairy, no fruit, no artificial sweeteners, no sugar. Don’t drink your calories, like juices, milks, etc. Low to no cal drinks like water, tea, coffee are ok.
No white carbs or carbs that could be white like bread, rice, cereal, potatoes, pasta, fried food with breading. Take Saturday off. There are things you can do to decrease the chance of fat storage on Faturday, so make sure you read up on those in the book. TF recommends consuming 30g of protein within 30 min of waking. I couldn’t stomach it. I usually skip breakfast, so eating that early was difficult for me. If I would have implemented this, I’m sure my results would have been better. Take progress pics to keep yourself motivated and on task, except around your period. See next point. Your weight will fluctuate around your period as you retain water. Whenever I got within 10 days of my period, I felt like I was regressing. TF did warn about that, but I still let it get to me. Make sure you're taking progress pics or taking measurements once you're past the "period window". Don’t be a bean fiend. I was eating way too many beans when I first started. I read something online, perhaps in a Reddit thread, that recommended limiting bean intake if you aren't seeing results. That made a huge difference. Have canned beans on hand. TF recommends relying on canned beans, but I liked pressure cooking batches of black beans and lentils a couple times a week so that I could spice 'em up. I would still keep canned beans on hand, just in case. Costco has tons of pre-cut veggies that you can just season, dump into a dish and roast. At first, we were buying whole heads of broccoli, cauliflower, etc., and chopping them up. Too difficult. We saved so much time with the Costco pre-cuts. Totally worth the membership fee! Spices and condiments are your friend! Playing around with seasoning and condiments will help you stave off the boredom of repetitive meals. Just make sure you read the labels to ensure they’re SCD compliant. Particularly watch out for hidden sugars in your condiments! Don’t snack. If you’re hungry, try increasing portion sizes at meal time or have a small slow carb meal as a snack. If you must snack, avoid domino foods like nuts, hummus and olives that are high-cal and add up quick. Have you tried the SCD? If so, leave a comment below. I would love to hear what your results were, what you liked/disliked and if you'd do it again.